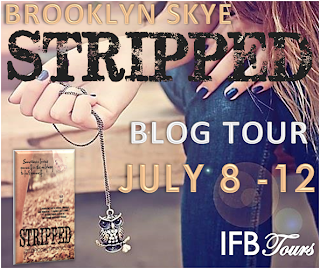 I really enjoyed Stripped by Brooklyn Skye and thought it was a good solid NA read. I really liked Quinn. I felt like it was weird but there was something about her attitude. She just seemed so interesting to me with the way she acted like she didn’t care. Sometimes her sister complex really got to me though, for a little bit I thought maybe they were twins or something since she was hung up on the incidents surrounding her. All the flashbacks she has kind of makes it seem like her sister wasn’t that nice. There are times when I think Quinn herself realizes how weird she is being but she can not help it. 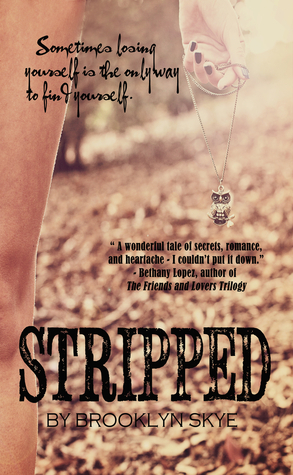 Quinn grows as the book goes on and as she discovers more things. As much as I didn’t agree with her reasoning for being with her boyfriend, she just seemed like people I knew in college who did things like that. Maybe I liked her because she felt real to me not being perfect and not always being completely likable. Torrin was easy to like, the mystery guy that deals with Quinn’s bad attitude. I liked how their relationship started, it was pretty cute. I just loved his personality too, he was so endearing to me for some reason. I wish I had run into him. I was definitely wondering what the mystery was behind him and kind of had an idea about some of it. Not exactly but I was close and I liked the way things came to light about him too. He would be up front with some information and then kind of stand offish about other things. I think it was a, if you don’t say anything it’s not lying, kind of thing. What I liked about the plot is that we know what happened to Quinn’s dad and we know what happened with her sister. Quinn narrates that part pretty early. Rather than her eluding to what happened and the reader having to guess. It doesn’t mean that there isn’t more to the story then what we know but at least we are on the same page as Quinn. Whether you agree with the way she is acting or not at least we know why she acts that way and we discover any secrets along with her instead of her holding all of the cards that we can’t see. The other thing I like is that her best friend knows her story too. I would get that sigh of relief like oh good at least she has an ally in all this. It seems like too often so many main characters and are completely alone and can only rely on new mystery guy. Overall it was a good read, I enjoyed it enough that I read it quickly and wanted to know how things developed between Torrin and Quinn. I also liked how things were revealed as we went along, although I couldn’t believe her parents. I felt like I was mad at them at points, especially towards the end. I like how Quinn goes from a hardened person to someone who comes into her own skin rather than remaining in her sisters shadow. Great review. I liked this one too overall. Great review. Looking forward to reading this one. Thanks!